It is always a good idea to start planning trip to Banff Canada in advance, since you are competing against millions of other travelers heading to the same destination Banff National Park as you are. Before you start planning trip to Banff, we would like to provide some information you might be interested in, such as when is the best time to visit and what weather is like here, what clothing need to prepare, what permits or documents you need to enter our country Canada, what is our currency and tax, and any other permits are required for visiting Banff National Park. When you are planning trip to Banff Canada, you always want to know when is the best time to go. July and August are the busiest time because kids are out of school. To avoid crowd, either June or September are good time to travel here, as June is the start point of high season when you can catch early wildflowers in bloom, and September is the end point of high season when aspen and larch trees turn golden, the airfare and hotels are not as expensive as July and August. And the mid-day temperature stays luxury warm. Winter of Canadian Rockies also attracts lots of skiers. The scenery of winter here is wonderful too. If you are planning trip to Banff Canada ski vacation, the busiest and the most expensive (accommodation) time are Christmas to New Year Holiday, Family Day weekend (2nd Saturday to 3rd Monday of February), March Break, and Easter (2nd Friday to 3rd Monday of April). Avoiding these holiday time period, the mid-weekdays is the best time to go. When planning trip to Banff Canada, you also want to know what weather is like here. So that you can decide what clothes you need to bring with you when you travel. Click here to find out Banff national Park weather and climate. “Do I need a visa to enter Canada as a visitor?” It is very important question to find out before planning trip to Banff Canada. It depends on your citizenship. Citizens from the United States, most Europe countries, or Australia, do not need Visa. Click here to find which countries and territories whose citizens require visas in order to enter Canada as visitors. If you do not need visa, you MUST bring your valid passport with you when you enter Canada. Our currency is Canadian Dollar (CAD$). Bills are available in $5, $10, $20, $50 and $100 dollar. The $1 and $2 bills have been replaced with coins (the Loonies and the Toonies). While you are planning trip to Banff Canada, you might want to know how much your money is worth in Canadian Dollars, XE.com Currency Converter will help. "Where could I buy Canadian Money?" When you are planning trip to Banff Canada, you should also prepare Canadian money. You can either buy it in your country before you leave, or buy it after you arrive in Canada. 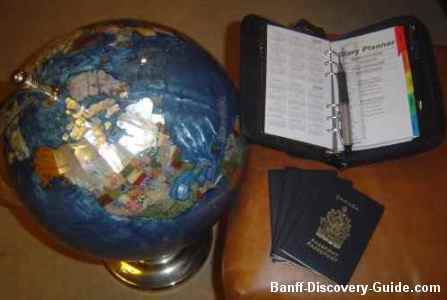 There are Currency Exchange offices in all of the International Airports, including Banff Gateway Calgary Airport. There is a currency exchange store in the town of Banff - Money Mart located at 117 Banff Ave. Town of Banff. Tel: (403) 760-3119. It is open 7 days a week. Besides currency exchange, it also sells phone cards you can use for long distance which is much cheaper than what your hotel will charge. To avoid encouraging too much exchange fees, buy as much Canadian Dollars as feel you need. If you need more, you can buy some more at Money Mart in Banff. All hotels, restaurants, gift shops and services charge 5% goods and service tax (GST). If you are not a Canadian Resident, you can get refund from visitor rebate program - the Foreign Convention and Tour Incentive Program. Most guides, drivers, restaurant servers, taxi drivers, house-cleaners who have done good jobs should be tipped. The standard service rate is 15%. The following listed fees are for your reference. The prices might change from year to year. Here, Senior: Age 65+, Youth: Age 6-16, Children under 6 years old are free, Family/Group: Up to 7 people in a single vehicle. Wilderness Pass is a mandatory permit for anyone planning an overnight trip into the backcountry of Banff National Park. It specifies the campsites you are using and the number of people and tents in your group. You need book the Backcountry campsite in advance. Wilderness Pass fee: 9.80/person/night, Annual Wilderness Pass: $68.70/Person/Year. Children 16 years old and under are free. To get your permit and reserve your campsite, you can call at (403) 762 1550, or email to: banff.vrc@pc.gc.ca. The earlier you call, the less chance the campsites are full. Backcountry campsite and shelter reservations can be made up to 3 months in advance of your trip. A $12.00 reservation fee will be charged. It worth it! Fishing License is required for angling ($9.80/day, 34.30/year), and a Grazing Permit for traveling by horse ($1.90/horse/day, 24.5/horse/year). So you have gotten the basic information of facts. Now it is time to start planning trip to Banff Canada. We will have plenty of information below to help you make your decision. The best time to visit here and what weather is like here – it depends on what you want to do here. Skiing or hiking. What outdoor clothing should be prepared for Rocky Mountain weather. It depends on what time of the year and what you will do here. The best way to travel to here – It depends on where you travel from and your preference. You probably consider how you get here by air, by bus, by train, or by car. The best way to get around here when you arrive here – Should you use public transportation, rent a car, take a taxi, or join tour groups? – You have options – High End Banff hotels/Lodges, or Moderate Hotels, Condo suites, Bed and Breakfast or hostels.